It was great to meet new people and it was lovely to see the smiles on their faces when we gave them what seems like nothing to us. I loved giving to them a hat a scarf some gloves a coat a jumper and if possible some trousers. At one nursery (in Manta) there was a little boy I helped. When he received his coat he suddenly went round to all of his mates and started giving them thumbs up. That was so cute! The team was also fabulous. Some I did not know but then I got to know them and I felt as if I was at home. It was amazing! At Crihana nursery, we had the amazing opportunity to go to each of the classrooms in turn and collect a child each to take them to the hall where the clothing distribution was taking place.There were some adorable children but one in particular who struck a chord with me. She was 4 years old and quickly and easily took my hand on instruction from her teacher. Her hair had been lovingly tied back with cute clips and a bobble. We communicated with a smile on the way to the hall and she looked at me with beautiful, enormous blue/grey eyes. As I led her around the room, finding clothes her size and trying items on, she continued to hold tightly to my hand but her expression was unchanging……her mouth straight and her eyes remaining huge, taking everything in……What was running through her head I wondered? What were her circumstances, her home, her family? Did she have siblings? Were her parents working abroad? Were the family struggling? Were they cold? Were they dreading the -20 temperatures that were looming and the snow that was inevitable? As we left the distribution room and returned to her classroom, still hand in hand, I carried the large black bag that contained her new clothing. She took it from me straight away but it was big and she was small and so I gestured to her that I would carry it for her. She allowed me to for minute but then we reached the stairs. She turned and determinedly took the bag, insisting on dragging it up the stairs herself. On arrival to her classroom she made a beeline for her locker and began shoving in the bag, as if eager to get it safe where she knew she could keep it, she knew it would be hers. This beautiful little girl, who could not tell me what her circumstances were with words, showed me with her eyes and with her actions that we had touched her and given her a treasured gift that she was eager to protect and not lose. I hope she will be warm this winter. My trip to Moldova was an extremely positive experience. Before I went, I thought the trip would be filled with sadness, guilt and pity – how wrong I was! We learned such a lot about the country (thanks to the amazing Victor & Yolanda) and discovered that the way of life in Moldova was very different from ours but that’s not a bad thing. We could actually learn a lot and improve our way of life by following their example. Where land allows, people are self-sufficient and live off the fruit and vegetables they grow as well as the chickens, geese and turkeys that they keep. With our packaged, refined supermarket food, I actually felt worse off. Obviously not everyone has land to grow food but communities look out for each other. Villages are a family. Victor and Yolanda took Lucy and I to visit an old school friend of Victors and give the family some warm clothes and blankets. Two adults lived in the house with their three children. The house, which the husband was building bit by bit on his own, consisted of three rooms. The main living area/kitchen/storage/wardrobe, a small room with a stove that was designed to heat the house (when money allows fuel) and a room that had one bed that the whole family slept in together. Although it was relatively warm in the sunshine outside, the house was cold and damp and I worried about the cold, cold months to come where the temperature drops to -25. How would our pampered children cope with such relentlessly cold temperatures? How would I cope? With Victor and Yolanda translating, we stopped for a chat and the mum never once complained about the situation or expected financial help. She asked about our families and wished us good health. Truly humbling. The warm coat distributions throughout the week were an amazing experience and I saw with my own eyes the importance of Keep a Child Warm. The smiles on the faces of the children when we found a coat or hat that they loved are something I’ll cherish forever. For those lucky enough to have a job, wages are low. A head teacher’s monthly wage is £130 although the cost of a winter coat is pretty much the same as we would pay here. This literally means that a choice has to be made about how wages are spent – rent or food? Food or boots? Boots or a coat? The money does not cover all of these things and that is why the KACW project is 100% vital. As I walked through the playground back here in England, taking my two boys to school, I remembered the schools we visited in Moldova. Our playground is safely fenced off with smooth tarmac… even soft, spongy tarmac for the younger children, with lots of outdoor toys and bikes. The class rooms are warm and friendly no broken chairs or nails for coat pegs. They have indoor toilets and warm running water. I can’t help having a heavy heart for the children we visited. Some would say “well they don’t know any different” and to some extent, that’s true but as a mother I know all mothers would like the best for their children and I feel for the parents in Moldova as very often they can’t provide as much as they would like to or need to for their children. We were able to clothe just over 1000 children in our week there which was a great achievement and hopefully this will not only benefit the individual child but also their family to help take some of the financial strain off but also so that they know that there are people who care about them. We gave one week of our time it was hard work and at times emotionally draining but in return Moldova has given me so much more. It is true – it is better to give than receive and it’s not just a saying. 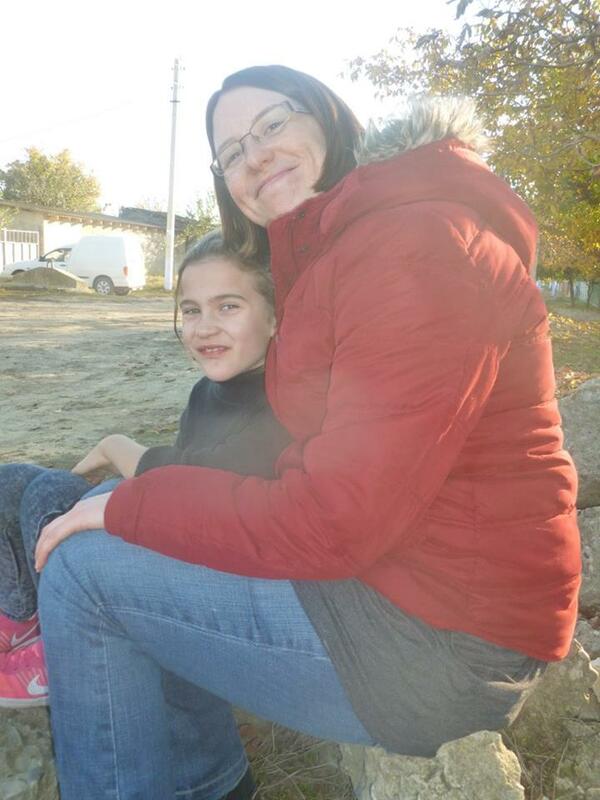 The people in Moldova can teach us so much….how to be grateful and content with what you have. Moldova might be the poorest country in Europe but they have riches that we have lost. They have close family networks and are more self-sufficient. I have come home back to England clinging on to what I learned there. I have even made some of their lovely fruit juice that they made for us. I could say so much about the trip and before I went (I will be honest) I did wonder if I was doing the right thing. It was one of the best things I have done with my life so far and I would strongly encourage anyone to go on one of these trips. All you need to be able to do is smile and be kind. You will come home again with a piece of Moldova in your heart that will help you see life differently.